Umfangreiches Werkzeug-Set mit allen wichtigen Größen verschiedener Handwerkzeuge in einem robusten Aluminium-Trolley. 200 mm Flachstumpffeile, 215 mm Zange, 250 mm Wasserpumpenzange, 160 mm Kombizange, 160 mm Seitenschneider, 160 mm Flachrundzange, 5x Hammer und Meißel-Set, 225 mm Wasserwaage, 150 mm Mini-Handsäge, 8x 150 mm Mini-Handsäge Klingen, 18 mm Messer, 10x 18 mm Messerklingen, Mehrzweckschere, 140 mm Spannungsprüfer, 2x Präzisions-Schraubendreher, 7x Schraubendreher (3 x 75, 5 x 100, 6 x 125, 8 x 150, Ph0 x 75 x Ph1 100 und Ph2 x 125 mm), 9x Sechskant-Kugelkopf Stiftschlüsselsatz (1,5, 2, 2,5, 3, 4, 5, 6, 8 und 10 mm), 9x Maulschlüssel (8, 10, 11, 12, 13, 15, 17, 19 und 22 mm), 200 mm verstellbarer Schraubenschlüssel, 340 g Klauenhammer, 150 mm Messschieber, 3 m Maßband, ¼'' Steckschlüsselsatz, 40x (¼'' Antrieb x 25 mm) Schraubendreher-Bits, 15x (5/16'' drive x 25mm) Schraubendreher-Bits, 2x Knarren (¼'' und ½'' Antrieb), ¼'' x ¼'' Antriebskupplung, ½'' x 5/16'' Antriebskupplung, 2x ½'' Antrieb Zündkerzenstecker (16 und 21 mm), 2x Universal-Stahlverbindungen (¼'' und ½'' Antrieb), 2x ¼'' Antriebsverlängerungsstäbe (75 und 150 mm), 2x ½'' Antrieb Verlängerungen (125 und 250 mm), ¼'' Antrieb x 115mm T-Bar gleitet, ⅜'' Antrieb (F) x ½'' Antrieb (M) 3-Wege-Adapter, ¼'' Antrieb x 150 mm flexible Verlängerung, 11x ¼'' Steckschlüsseleinsätze (4, 5, 6, 7, 8, 9, 10, 11, 12, 13 und 14 mm), 11x (½'' Antrieb x 38mm) Buchsen (12, 13, 14, 15, 17, 18, 19, 20, 21, 22 und 24 mm), 3x (½'' Antrieb x 42mm) Buchsen (27, 30 und 32 mm). Kendo Alu-Werkzeugtrolley, 161-tlg. wurde bewertet mit 4.6 von 5 von 50. Rated 5 von 5 von Sayley aus Easy Christmas present Having bought this kit a year ago, it took no hesitation in taking advantage of the value of this kit, to buy one each for three of my son's who own there own homes! 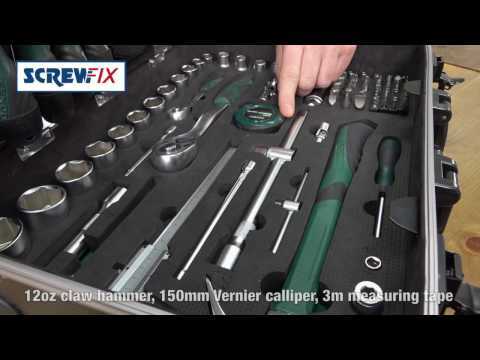 A full range of hand tools tidally kept together in one easy to handle trolley. No more scrambling through tool bags or buckets! All the tools kept easily in its correct place by a moulded case. Surprisingly the tools are of a high quality and are durable enough to sustain any amount of work. Perfect for storage either in the home, car or work vehicle. A must buy and do not be put off by the past experiences we all have had when buying multiple piece tool kits... it really is worth every penny and more. Rated 5 von 5 von Bricrow8 aus Engineers must have My van and tools have been stolen, so we bought this tool set to enable me to do some work until i can replace all that i've lost. Since purchasing it i've now found that I may not need to purchase so many more tools as this kit has most of what I need in the convenient case. It has wheels woohoo my back is less stressed. Brilliant kit so get yourself one is all I'll say. Rated 5 von 5 von CrispyPlumber aus Tidy little kit I'm an experienced plumbing/heating engineer and I was looking for a way of keeping a decent selection of tools to hand for taking into properties without having to go back and forth to the van, and keeping my van tidy. This fits the bill exactly. There is even some room in the bottom for my water pump pliers, boiler screwdrivers, pipe slices etc. After adding a few items of my own, I now have a decent toolkit that I can transport into a property and this saves me a lot of time during the day. The handle and wheels take a lot of the strain out of moving it as well, so it's fairly easy to deal with the weight of it. In terms of criticism I think that I would have to say that some of the tools are not to my liking but then I have a particular requirement in my job. The tape measure should be a 5 meter and not 3 meter, the wire stripper/crimper is not really up to the job I use it fro so I replace it with my own (but it works ok for light duty), and the spanner sizes could do with a few additions at the larger end. Other than that I like this toolkit a lot and have already recommended it to other people in the trade. Rated 5 von 5 von Benollis aus tool kit Very handy and easy to manoeuvre around from place to place. One problem i have had is one of the legs have fell off but easily fixed with a block of wood or by returning it. Another problem i have had is without the thicker foam in the bottom compartment then all the sockets don't stay in place but other than that its overall a handy tool kit. Rated 5 von 5 von captaintroy aus a no brainer This is a great tool kit with good quality tools in a nice metal case have used these tools in different trades from boats to buildings and have never had an issue. Highly recommended and a no brainer at the money. Rated 5 von 5 von mrjoe007 aus Neat Kit Good variety of tools very neatly laid out. Case it very good quality and easy to wheel around or carry like a suitcase. Tools seem of good enough quality for occasional use like I iwll be using.